The sedanapocalypse, it must be acknowledged, is upon us. We’re all getting bloated crossovers and SUVs because they are “just as good” and yet have “all-wheel drive” and “extra ground clearance.” But while crossovers have more advantages for some buyers than a lot of enthusiasts would like to admit, we don’t all need to go down that path. We have choices. 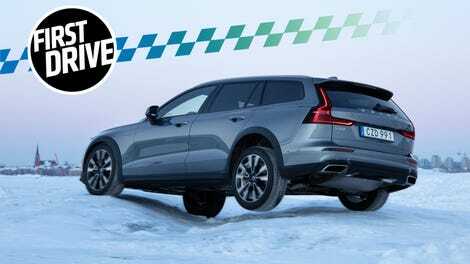 And the 2020 Volvo V60 Cross Country is proof. Don’t get me wrong, the V60 Cross Country is still very much a “crossover,” in a manner of speaking. There’s a regular Volvo V60 wagon, and Volvo has taken it, jacked it up, added some off-road bits, and put it on sale. If that’s not a crossover by definition, then I don’t know what is. But there’s a whole different philosophy involved when you start with a crossover from the very beginning, or adapt an already-existing wagon. And the V60 CC proves that adapting the wagon is better. But I’ll get to that. The Volvo V60 Cross Country is the widely-available version of the uncommon V60 wagon, which is the wagon version of the S60 sedan. What makes it “Cross Country” is not its middle school cardio workout, but rather its 2.9-inch lift over a standard V60, along with a BorgWarner all-wheel-drive system, some nifty off-road modes in the software that offer things like automatic hill descent control and hill start assist, and some rugged-ish looks. And this thing will sell. Or it would, were it not for all the full-on Capital-C Crossover SUV that’s essentially the same size, the Volvo XC60. It’s also not to be confused with the old Volvo V70XC, which is another lifted wagon that was once made by Volvo. I know, I know, it might be confusing but just go with it. And Volvo has certainly gone with it, considering that its been selling some sort of a wagon with a lift and body cladding for over 20 years now. The last V60 Cross Country was, in hindsight, a bit sad. It came out in 2015, five years after the V60 generation it was based on debuted. That’s a long time. Long enough for it to have felt like the a cross country-fied version was an afterthought, that the variant wasn’t baked in. And it showed. It looked and felt just like a lifted version of a car that wasn’t really ever supposed to have a lifted version. It had AWD, sure, but it was sort of a dopey system. If you tried to get remotely anywhere close to fun, it would freak the hell out. This, though—this one debuted, in relative terms, immediately. Volvo’s been planning this generation of V60 Cross Country right from the beginning. And it shows. For what 99 percent of owners are ever going to do, it just works. That’s still enough to give it 250 horsepower and a delightful 260 pound-feet of torque (the torque peaks at 1800 RPM so there’s no perceptible lag), and which weighs roughly 4,100 pounds, depending on options, and the eight-speed automatic that’s in seemingly every car these days. Volvo claims a zero to 60 time of 6.8 seconds, and I don’t see why that would be wrong. But it’s got tons of interior volume, with Volvo claiming a luggage volume “including underfloor storages” of 31.7 cubic feet. Volvo has damn near perfected the idea of “let’s build the same exact damn thing for all our cars, just with more or less leather.” It’s what carried General Motors to greatness in the 1950s, and Volvo is doing it now. Pretty much all Volvo interiors these days are exquisite, and compete with Mercedes for who’s making the best mainstream interior right now. And not only does it look good, it feels good. Everything you touch feels like someone actually put some thought into it. I’m not entirely sure the seats measure up to the legendary previous-gen S60 seats, I’m not convinced they don’t, either. It looks extremely good from the outside, too. Sorry, Mr. I’m-About-To-Write-An-Email-About-Well-That’s-Just-Like-Your-Opinion,-Man, that’s an objective fact. Sure, it’s a bit derivative of every single other car that Volvo makes right now, but it’s a muscular stance paired with the still-futuristic-looking Thor’s Hammer headlights. It looks good. Given precisely the right conditions, it can be incredible fun. “Fun? !” it asks. “Sir would like ‘fun?’ But I don’t even know what that word means!” the computer gibbers to itself, before stutter-stepping straight over an understeer-y cliff. And, to its credit, if you leave everything in normal mode, that’s how the 2020 Volvo V60 Cross Country reacts, too. Volvo took us out onto the frozen Gulf of Bothnia, as one does, where they had constructed a giant ice track, again as one does, and out on the track we could see that, left to its own standard settings, the V60 CC will, again, get upset with you if you try to drive like a loon. Understeer, warning lights, the whole works. Massive beautiful, easily controlled snow drifts are possible. Chuck it into a frozen ocean ice race track corner, stomp on the gas like a goofball, spin the wheel to the opposite direction you were originally intending, and now you’ve got an icy gymkhana stew going. If you’ve got a corner in the opposite direction coming up just lift off the gas for a second, use all that potential energy loaded up in the springs, turn the wheel and get back on the gas to keep it going. Every so often you can feel the car reigning you in, cutting the throttle, dabbing on individual brakes, but it’s so much less. Throw in the seatbelt pre-tensioners sucking you into the seats with the force of Andre the Giant giving you a bear hug because the car thinks that, despite all your fun, you are still going to die, and you’ve got a recipe for a big Volvo wagon that can actually rock your socks. And here’s what I’m talking about when I say that this wagon, adapted to be a crossover, is better than an SUV-ish crossover. Volvo brought us an XC40 for comparison, and the difference was apparent. When trying to have real, slidey fun with it, the XC40 just wasn’t the same. Not only did it feel more precarious, it understeered no matter what, going wide, and generally freaking out. “Fun? !” the XC40 seemed to exclaim. “Sir would like ‘fun?’ But fun is only a Costco run!” And then it’d rein you right in. On a frozen ocean ice track. In the north of Sweden. Just a few miles short of the Arctic Circle. And therein lies the rub. Want to show off how “fun” your car is? The test is at Spa-Francorchamps, and every goddamn car is fun at Spa-Francorchamps. If your car isn’t fun going up Eau Rouge, then something’s wrong with you, the driver. Sure, a lot of trips aren’t too crazy, and some are downright boring. But this one involved a trip all the way up to Northern Sweden, where we drove on roads that are probably pretty smooth when they aren’t covered in snow and ice, and with bumps that are smoothed out by a nice layer of snow and ice. And then we went into a Volvo V60 Cross Country that yes, did benefit from the glories of seat and steering wheel heaters, but also had the benefit of studded tires. Now I’m definitely NOT saying that Volvo’s all-wheel-drive system is bad, it’s probably delightful in lots of real world conditions. But is it truly excellent? Or was it the tires with the spikes sticking out of the tread? Or was it the frozen ocean ice track? I can’t say. We’ll have to wait until we get one on real, American, garbage trash infrastructure to find out. I’m not sure any of that matters, however. There’s not a vast selection to choose from if you’re hunting for a jacked-up wagon that also looks good, at least not here in the States. In Europe, you can get the Mercedes-Benz E-Class All-Terrain and an Audi A6 Allroad. But here in America? A Subaru Outback is a bit downmarket. You can cross-shop with a bunch of BMW X-whatevers, but they’re SUVs. Or “Sport Activity Vehicles,” which is a term that should be against the law. Probably its closest competitor here is the Audi A4 Allroad, and you’d do well to look at both. This one doesn’t have a price just yet, but a Volvo spokesperson told us to “look at V90/V90 Cross Country comparative structure for a rough idea.” The V90 Cross Country is $1,100 more than the V90, so you should expect the V60 Cross Country to be about $1,000 more than the $38,900 base price of a regular V60. So about $40,000 is my guess. The Volvo V60 Cross Country should be in a sweet spot, but instead of taking advantage of it and resting on some laurels, it’s still really good. Because it should be. It’s a Volvo, and modern Volvos just aren’t allowed to be bad. The outsides look brilliant. The insides feel nice, yet understated and classy without falling into the pit of Tesla minimalism. The big infotainment screen works well, and gives you the vaunted Gothenburg-mode sound system. There’s plenty of trunk space. The seats are comfy as hell. If a lifted-up wagon is what you want, you’d be hard pressed to seriously consider buying anything else.